The site of the proposed place of worship behind the new Co-op to the south of Morpeth. A new home for Morpeth’s Jehovah’s Witnesses has been given the green light, despite neighbours’ parking and traffic concerns. An application for the construction of a place of worship (use class D1) together with parking and external works on the town’s southern edge went before the Castle Morpeth Local Area Council for a decision on Monday (January 14). 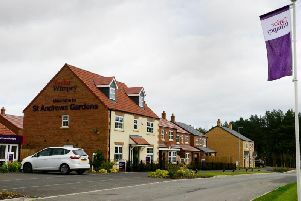 Planners had recommended the scheme, for a plot behind the new Co-op on land north of Caldburne Drive, for approval and councillors backed it unanimously after being persuaded that issues raised in 37 objections had been adequately addressed. It means that the congregation will be moving from its current Kingdom Hall behind Shambles on Bridge Street, where it has been since the 1950s, but which suffers from access problems, particularly for the likes of wheelchair users. The main concerns raised by residents was related to roads and parking and Couns David Bawn and Richard Wearmouth asked questions of the council officers along these lines. Highways officer Graham Fairs explained that based on the number of seats proposed in the building, the 25 parking spaces to be provided are more than double what would usually be required – a ratio of one space per 10 seats. He said that having looked at all of the data, 25 spaces ‘should be adequate most of the time’ and the applicant must provide an events management plan to detail how parking would be dealt with when there may be more people than usual in attendance. Mr Fairs added that the busiest times are likely to be evenings and Sunday mornings, meaning there is less conflict with other traffic and pressures on parking spaces. Coun Wearmouth noted that the County Hall car park, across the road from the site, could be used at these times if the county council acted as ‘a good neighbour’. Members also heard that a late objection had been received from the occupants of the nearest home, to the north, whose garden adjoins the site. While tree-planting had been proposed on this boundary to screen the new building, the neighbours were concerned about the roots affecting the existing hedge and the loss of light. Given this, a condition attached to the approval was amended so that it just requires a landscaping plan for the whole site to be agreed. An additional condition to limit the building’s use to a place of worship was also added, as class D1 in planning terms covers a wide range of public buildings, such as health or education premises, exhibition halls and museums. Planners were concerned that other uses could have more severe highways impacts than the current proposal for a place of worship.